It's that time again where we implore you not to buy gadgets, because there's a whole hunk of new wearable tech we expect to be announced. 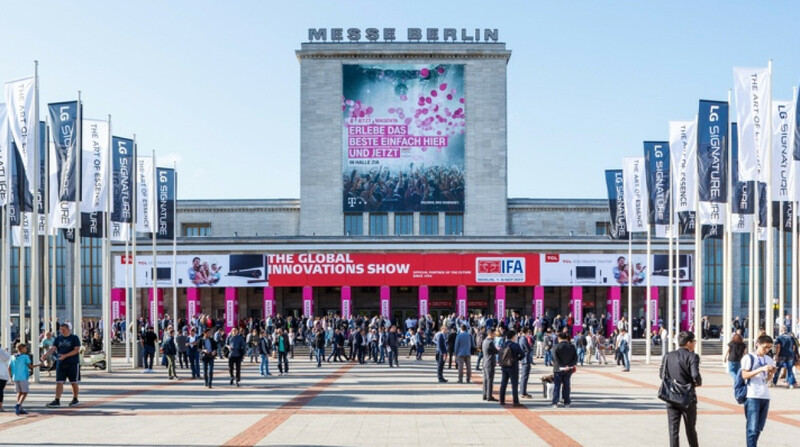 The 2018 edition of IFA, everyone's fave Berlin tech expo, has kicked off and we've been on the show floor getting our hands on with the very latest smartwatches, sports watches, fitness trackers and more. After the pre-IFA unveilings of the Samsung Galaxy Watch and Fitbit Charge 3, here's what's been unveiled in the world of wearable tech, VR & AR at IFA 2018. Fossil Group has already kicked off its fourth generation Wear smartwatches with the introduction of its new feature-packed Q range and its Michael Kors Access Runway collection. That doesn't mean Fossil Group's many sub-brands can't get in on the action. Skagen has announced its feature-packed Falster 2, for instance, adding GPS, NFC, a heart rate sensor and waterproofing to its beautiful design. That design has seen minor tweaks to the original version, including more programmable buttons and a slimmer bezel. You can check out our Falster 2 review from the show floor. Similarly, the new Diesel On Full Guard is also getting upgraded with GPS, NFC, heart rate and 3 ATM waterproofing, which the company says is save enough for swimming. Diesel is also upgrading the Full Guard's micro-apps, which include an interactive heart rate dial and a flickering Diesel logo. Take a look at our Diesel On Full Guard 2.5 review from the floor. Fossil has also announced a partnership with Noonlight, formerly known as SafeTrek, that'll add a one-touch software panic button to its smartwatches. When tapped, Noonlight's dispatchers will try to contact you to make sure you're alright. If you don't respond, they'll get in contact with first responders. The feature will roll out to the Q Explorist and Q Venture first. Casio is back for thirds with its latest Pro Trek smartwatch, the WSD-F30. Like Casio's other smartwatches, this one is all about the outdoors. Like its predecessor, the F20, there's built-in GPS and maps you can use when you're offline. However, the big deal here is that battery life is getting a boost from one day to three thanks to the new Extend Mode, which switches to a secondary monochrome display that displays the time. Check out our ProTrek WSD-F30 review from the show. When you click one of the physical buttons while in Extend Mode you'll still get to see a color map. The color display is an improved 390 x 390 OLED display that can apparently show maps in finer detail. Casio is also teaming up with the likes of Viewranger, Hole19, Glassy, Fishbrain and more to give the F30 some built-in apps. No word on pricing or a release yet. While we're still hoping for a refreshed version of the Forerunner 935, Garmin has gone ahead and announced the Vivosmart 4. The big new feature here is a pulse oximeter to track your blood oxygen saturation. It'll also be used to augment your sleep data and sleep stages, which the Vivosmart 4 also supports - opening the door to identify sleep apnea one day. There's also something called 'body battery' energy monitoring, which will take into account how much energy your body is using and tell you when you're ready for your next workout. It's like a more general version of Garmin's Training Load feature. There's also stress tracking, VO2 max, a redesigned heart rate sensor, relax reminders, and the usual workouts. It's available to order now for $129.99. Acer took IFA to announce a new version of its Windows Mixed Reality headset, the OJO 500. Announced a year after the original, the big new thing here is a modular design that lets you take off the lens and head strap. That modularity is intended to make it easier for museums and such to use and maintain the headset. The head strap has built-in headphones, but if that's too hard for you there's also a soft strap that will let sound be a little more flowy. As for specs, there's a 100-degree field of view and two 2.89-inch LCD displays that combine for a resolution of 2880 x 1440. It'll be available next year for $399. The Sony FES Watch U was first teased at IFA 2016, then went on sale in Japan in 2017. Now, in 2018, Sony has announced that it'll go on sale in Europe in September. The e-paper smartwatch was born from Sony's Seed Acceleration Program and is fashion focused. Basically, it uses an e-paper display on the strap and watch face that you can use to change the look of the watch with a push of a button. The silver version will cost £529 while the black version costs £699. With both Fitbit and Garmin now playing in the kids wearable game, it's clear that it's going to be big business in the future. Norwegian based startup Xplora were one of the first to launch a smartwatch built for kids and it's going to be showing off its next generation watch at IFA. The Xplora 3S features a waterproof design and a camera for shooting stills. Child safety remains at the heart of the device with features like phone call support, real-time location tracking and the ability for parents to set up safety zones all still on board. You'll probably notice there's a bunch of other companies we've not mentioned above. We're talking the likes of Samsung, LG, Asus, Lenovo, Polar, Harman, Honor and Qualcomm. That's because we didn't get much in the way of announcements from these names. We didn't get a Huawei Watch 3 or new LG Wear smartwatch and Samsung didn't have anything to add to the Galaxy Watch. Hopefully that just means that there's some big unveilings left to look forward to before the year is out. What about the leaked photos of Polar Vantage?